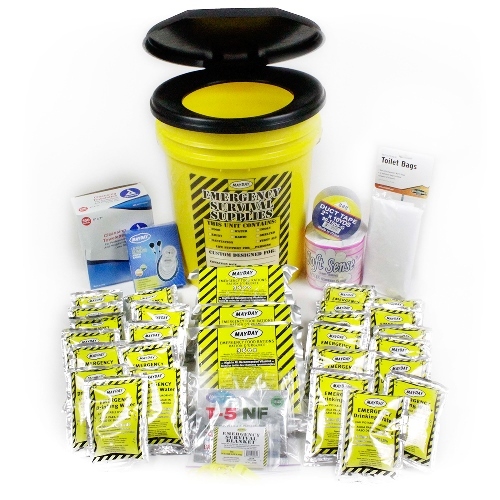 Popular Classroom Emergency Go-Bucket Kit holds all the essentials for school lockdown, earthquake survival, hurricane, tornado, storm, emergency sanitation, classroom safety. School safety kits are packed in crush-resistant 5-gal honeybucket – assembled in USA! Makes a perfect, easy-to-grab Back to School Kit! Classroom Emergency Lock Down Safety Bucket Kit makes an Easy, Ready-to-Grab Back to School Kit! This great Classroom Lockdown Bucket Kit is the most popular of our school disaster bucket kits – Our survival go-buckets make terrific classroom emergency kits – perfect for earthquake, hurricane, tornado, severe storm – School Lockdown supplies for any school emergency! 3 – 3600-calorie Survival Food Bars – Each 5-year shelf life emergency food ration bar is scored to break easily into 9 pieces for convenient portion control, easy-to-grab Emergency Food Storage for School Safety Buckets! Survival bars are US Coast Guard approved. 30 Emergency Water pouches – 5 year shelf life offers long-term water storage for this handy, ready-to-use classroom kit – US Coast Guard approved Survival Water comes packaged in five reusable, collapsible drinking containers with built-in pour spout – each containing 6 individual pouches of Safe Drinking Water for Classroom Kits. 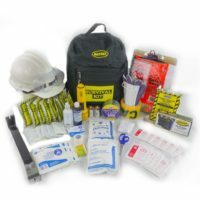 Classroom safety kits are an essential part of every school emergency plan, including those implementing A.L.I.C.E. 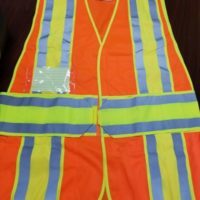 guidelines for classroom ALICE safety bucket kits – Alert, Lockdown, Inform, Counter, Evacuate – for school emergency go-kits. 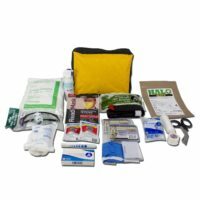 All Sunset Survival School Kits are assembled in the USA! 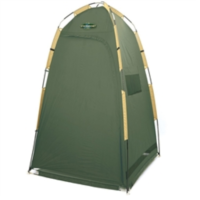 Consider adding a Deluxe Privacy Room Cabana for a quick, pop-up Privacy Shelter for use as an emergency classroom lockdown restroom or changing area. *Call 714-369-8096, or email support@sunsetsurvival.com, to customize classroom lockdown bucket kits or other school safety kits for your school or community organization.